How one woman's soul-searching journey led her to the Mormon church and how her discovery of Jesus helped her leave despite horrific persecution. In Out of Mormonism, Judy Robertson shares her unique insider's viewpoint as a woman in the Mormon church. After she and her husband rediscovered God's truth, they faced torment and persecution upon leaving the LDS church. This reader-friendly book is one of the few Christian books that focuses first on an individual's journey from Mormonism rather than on theology or Christian doctrines. The revised edition includes testimonies of others who have left the Mormon church and what God is doing today through Concerned Christians. Readers will find Out of Mormonism a useful resource for understanding and witnessing to friends and family in the Latter Day Saints church. 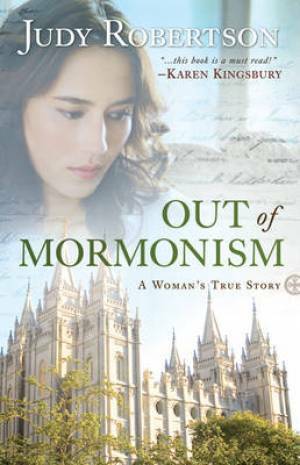 Out of Mormonism by Judy Robertson was published by Baker in August 2011 and is our 18236th best seller. The ISBN for Out of Mormonism is 9780764209017. Judy Robertson tells the story of her family’s involvement with Mormonism very directly and honestly. One can see from her description how perfectly good people, with the best motives, can still, by degrees, be drawn into the spiritual cul-de-sac of the cults. Her book reveals aspects of Mormonism which, if it did not involve people abdicating their freedom to decide and a kind of mental enslavement, would appear merely ridiculous. This book is a standing warning to the mainstream genuinely Christian churches to care for vulnerable people in their neighbourhood. 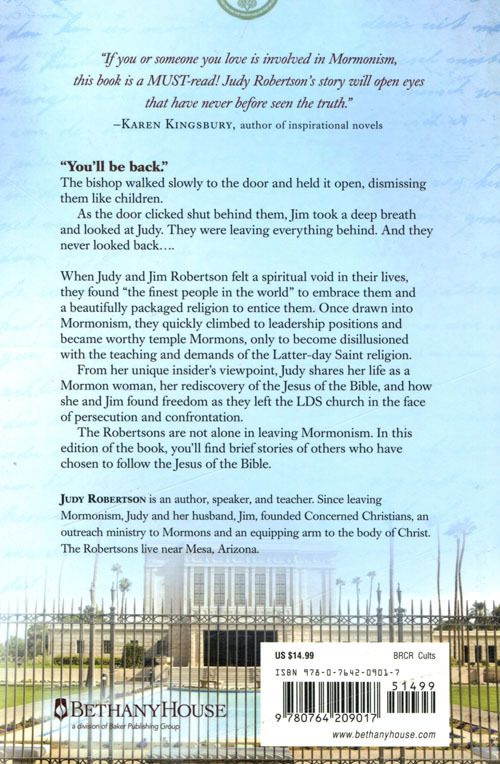 Judy Robertson tells the story of her family?s involvement with Mormonism very directly and honestly. One can see from her description how perfectly good people, with the best motives, can still, by degrees, be drawn into the spiritual cul-de-sac of the cults. Her book reveals aspects of Mormonism which, if it did not involve people abdicating their freedom to decide and a kind of mental enslavement, would appear merely ridiculous. This book is a standing warning to the mainstream genuinely Christian churches to care for vulnerable people in their neighbourhood. Got a question? No problem! Just click here to ask us about Out of Mormonism.